If you are going for a meal or having a party for your little man’s big day why not choose a stylish shirt and printed tie suit? These are great for little boys as there will be no worries about them wearing a real tie and yet they still have a smart and formal look to them. Some of these outfits can come with a waistcoat and/or braces which look adorable and will definitely get your little bundle of joy noticed. 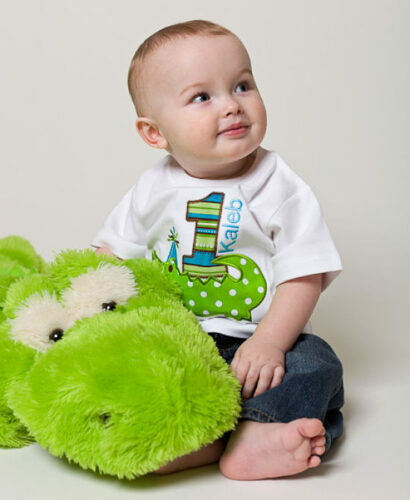 Personalized or printed t-shirts are another great idea for a first birthday outfit. They are a one off so hold even more sentimental value especially as you can have your own design, logo, baby’s name and/or a message written on it also. These can also be matched with either casual jeans or even smart black trousers. So finding your perfect combination for the big day is easy. Hats are a great accessory for children. During the summer and spring not only do they protect from sun rays but also make a great addition to suit outfits. Hence they are definitely a must have for outdoors parties in these seasons. Flat caps and mini trilbies are fantastic options when it comes to headwear especially for finishing off that perfect first birthday outfit. During the autumn and winter periods why not venture more for wooly hats and scarves? Not only are these simple and warm but will add great shape to your tiny one’s birthday attire. Party hats are also an easy yet effective option. Footwear can be a tricky one when it comes to babies and tiny tots. As every mother knows, they prefer not to wear shoes and will quite happily kick them off at every opportunity. But for this special day why not go for a cute pair of lace up sneakers? These are great as lace ups are less likely to come off. As well as look smart with any outfit they come in a wide range of styles and colors. Why not check out our article on Awesome Collection of Converse Shoes and Sneakers for Kids for more shoe ideas. Check out the following images and gain inspiration and ideas for your little man’s big day. 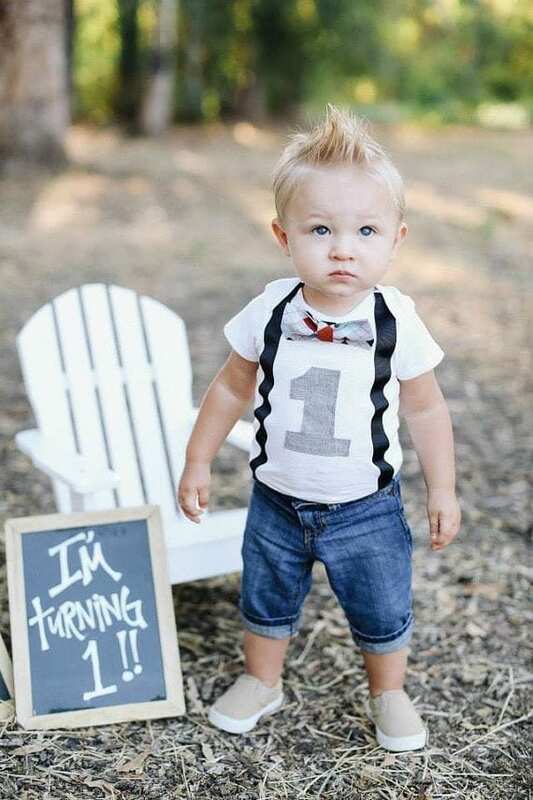 We all know that suspenders look cute and perfect for every man then why not make your 1-year-old wear suspenders at their first birthday. You can pair up red suspenders with dark blue jeans and make them wear white and black stripped full sleeves shirt inside. You can also change the colors of the suspenders accordingly. It’s also a great idea to make both the dad and the baby boy wear similar outfits like this one. 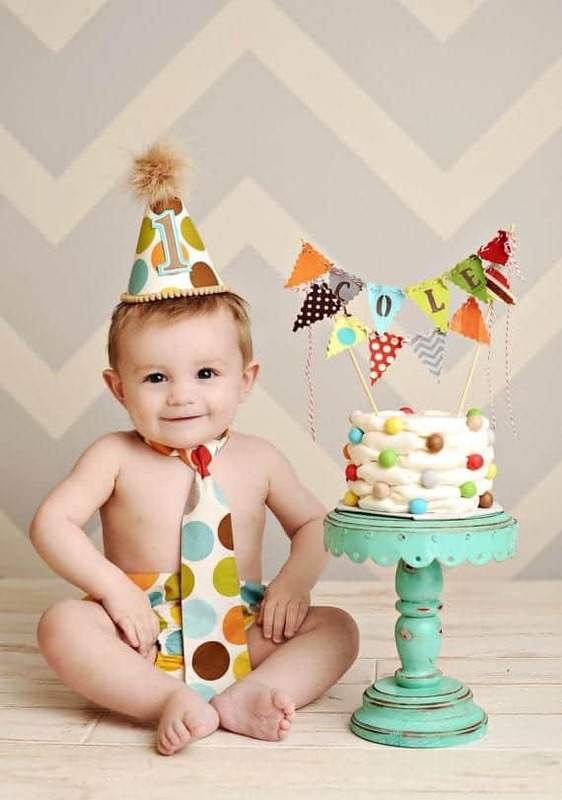 For a funky shoot on your boys’ 1 birthday, he does not have to wear a full suit, he can only go for a tie and match undies to look funky and cool. You can match the dress according to the color and theme of the whole party. For example, if your whole party is of multi-colored theme then you can also wear multi-colored tie and undies for a perfect birthday shoot. Or even if your baby boy is all dressed up for the party, you can give him this look for the cake smashing ceremony as you wouldn’t want his special outfit to get all messed up. Give him a good hairstyle for this special day …don’t fear to go little funky. 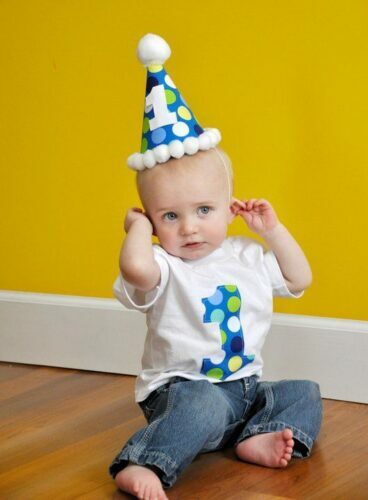 You can also make your 1-year-old wear a funky shirt, the one that has cute little things drawn on it or written on it. And wear it with blue jeans folded one inch from the hemline. You can also make them wear a cute and funky bow tie to complete the look. For shoes, they can wear sneakers or any other funky boots to match the theme.